Ahead of Schedule, H1N1 Flu Season Arrives in the U.S.
A dose of flu vaccination is administered at TC Williams High School in Alexandria, Va.
On the edge of the Western plains, in Spokane, Wash., the reports of significant student sickness started coming in this week. By Thursday morning, nine of the area's roughly 300 schools were reporting absentee rates in excess of 10%. H1N1 had arrived with the end of summer, just as expected. "This would be comparable to what we would see in a moderate flu season in January or February," says Mark Springer, the Spokane Regional Health District's epidemiologist. "This is just a snapshot in time. We would anticipate increases." Across the country, the pattern is much the same. This year's novel flu virus is hitting much sooner than normal, long before cold weather forces people inside, where viruses like to fester, and weeks before the official start of flu season on Oct. 4. The virus has been gobbling geographic terrain in recent weeks, with 26 states reporting widespread flu illness on Sept. 19, up from 21 states a week earlier and just four states at the beginning of August. The good news is that hospitalizations remain an exception for those getting the flu, and deaths of children have been relatively rare  with two or three pediatric deaths being reported each week, below the threshold of a full-blown epidemic. Over the past year, the Centers for Disease Control and Prevention (CDC) has received reports of 117 influenza-related deaths of children, of which 25 occurred in children younger than age 2 and 35 occurred in children ages 5 to 11. "Flu season is definitely here," says Dr. Anne Schuchat, a CDC assistant surgeon general who is helping to coordinate the response. "We don't know when it is going to peak or how many waves there will be." But Schuchat and other government officials are getting closer to putting a better solution in place. As Schuchat made clear on Sept. 24 in a briefing at the White House, the flu vaccine is set to arrive in the next few weeks, sparking a national vaccination campaign that will be run by state and local governments. Early tests on the vaccine have been promising: there are no red flags about safety, and studies suggest that many Americans will be able to build up sufficient flu resistance with just one dose, instead of the two or three doses that were initially predicted. About 40 million doses of the vaccine should be ready by mid-October, with an additional 10 to 20 million doses added each week through the end of the year. 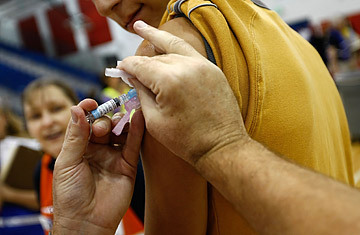 The 2009 H1N1 vaccine will be free, with public distribution in most areas. Among those the government has prioritized for the voluntary vaccine: all school-age children, pregnant women, caretakers of young babies and people with chronic health conditions that could weaken their immune systems. In Spokane, Springer is carefully tracking the numbers to see how the illness behaves before local school children have a chance to be vaccinated and will continue to do so for a full two weeks afterward while immunized kids build up resistance to the virus. That leaves as much as a month to six weeks during which the flu can continue to spread throughout schools. "It will be interesting to see what will happen over the next month or so," Springer says. Read "Swine Flu: 5 Things You Need to Know About the Outbreak."